Seeing as there is a lot of discussion on the best way to house NZ’s growing population, and how to cope with increasing housing unaffordability, it seems like an appropriate time to post this picture. Some things never really change. 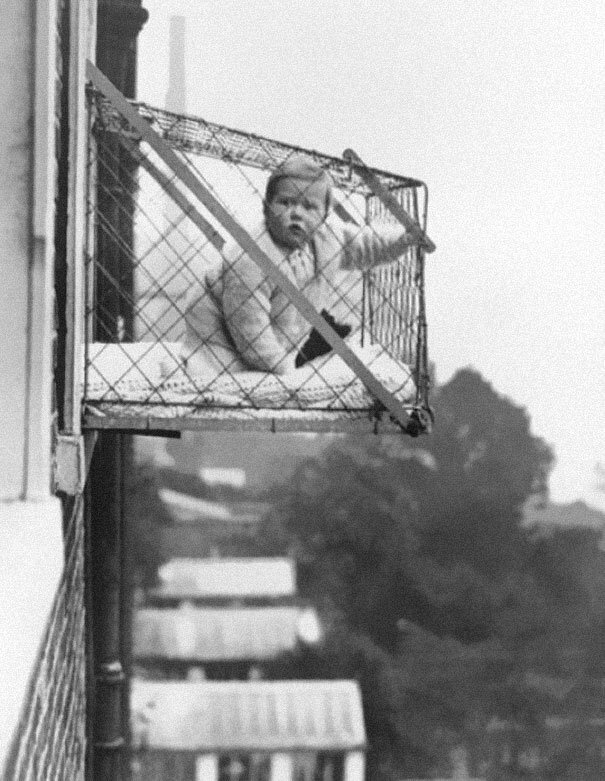 Photo taken in 1937 with a lovely device (not so sure whether it would pass Health and Safety guidelines now though…) to place your baby in if you lived in a highrise. Clearly not in this country, as I don’t think we had any High high rise buildings in 1937, although some people have a tendency to call anything over 3 stories a “skyscraper”. Muppets. But it goes right to the heart of a conversation they have been having in Auckland up at the Transport Blog site. Some people are still bemoaning the fact that the new Unitary Plan is advocating for the smallest Auckland hovel home to be set at min 40m2 and with an 8m2 balcony. Some of the pratts there arguing that 40m2 is too big, and that they could fit a two-bedroom apartment in that vast amount of space. Seems like rubbish to me. Must say though, that an 8m2 deck does sound almost comfortable. Probably not if it was 8m long x 1m wide, but 5m wide x 1.6m is actually quite a usable space.